Each kit contains 1 ounce of a non-toxic super-concentrated hard water stain remover capable of removing the most stubborn hard water stains and soap scum. Plus it contains two special cleaning towels: the original blue microfiber towel and the white world's thinnest BriteWipes microfiber towel. 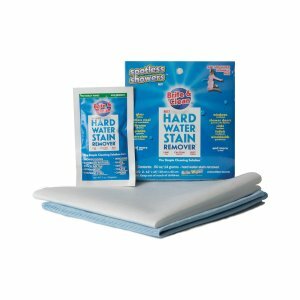 Rub away years of difficult hard water stains with the white towel and cleaner, then wipe to a streak-free shine using the blue microfiber towel. Safe, eco-friendly formula is easy on the hands - no smelly fumes - Soap Scum Hard Water Stains Mineral and Rust Deposits. Remove hard minerals, rust, calcium, alkali. Stainless steel. Remove stains in sinks and tubs. Contains two 1/2 oz. simple cleaning single - enough for 1 shower -Rust remover stainless steel rust remover, all purpose rust remover, rust remover powder, rust remover chrome, remover for metal. I had such high hopes that I had found a product that would finally take the hard water spots off the windows. Nope. Will continue on my quest. The product did not work. Would appreciate any ideas. Better than anything I ever used. I plan to go over my shower doors again to see if it comes almost perfect, but Brite&Clean is as good as I'm aware of and therefore, I recommend this product. Good product. Works great and we have very hard water. This Product Has The WOW Factor! As a professional cleaner for over 30 years I seldom run into a product that Wow’s me. This product really Has the Wow Effect. No more cloudy shower doors now crystal clear. For the Professional this is a awesome Add On for easy extra money. This product really delivers.